Early, Tuesday morning, April 9, 2019, Maria Christina Moritz ran into the arms of her Lord and Savior, Jesus Christ. As a healed child of her King, she is now dancing and praising Him – complete in His presence. Maria was born, January 26, 1996. By the hand of God, in February, 2000, Maria became the daughter of Christene Moritz – two lives that were called to be together. 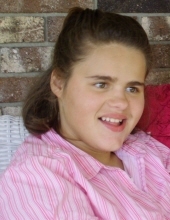 On March 20, 2012, Maria decided to give her heart to Jesus and became a child of God. She is a tool used by the Lord to touch the hearts of many people all over the world for Him. Maria liked to rub a hand, “hummm” her content little song, and be involved in all happenings. “Little Miss” Maria is loved and missed by her mother Christene, her Grandparents August and Gay Moritz, and also by uncles, aunts and cousins. Please come join us for a Celebration of Maria’s life on Monday April 15, 2019 at 11:00 a.m. at Word of Truth Christian Center, 1163 Napoleon Rd. Bowling Green, Ohio 43402. Pastor Jerry Hunt will officiate. Interment will follow at Plain Township Cemetery. Visitation will be held Monday morning at the church from 9:00 a.m. until the time of the service at 11:00 a.m. Funeral arrangements have been entrusted to Dunn Funeral Home in Bowling Green. Memorial contributions may be given in Maria’s memory to Joni and Friends Ohio Family Retreat. To send flowers or a remembrance gift to the family of Maria Christina Moritz, please visit our Tribute Store. "Email Address" would like to share the life celebration of Maria Christina Moritz. Click on the "link" to go to share a favorite memory or leave a condolence message for the family.